KHAN!!!! The Potato and Star Trek find each other. 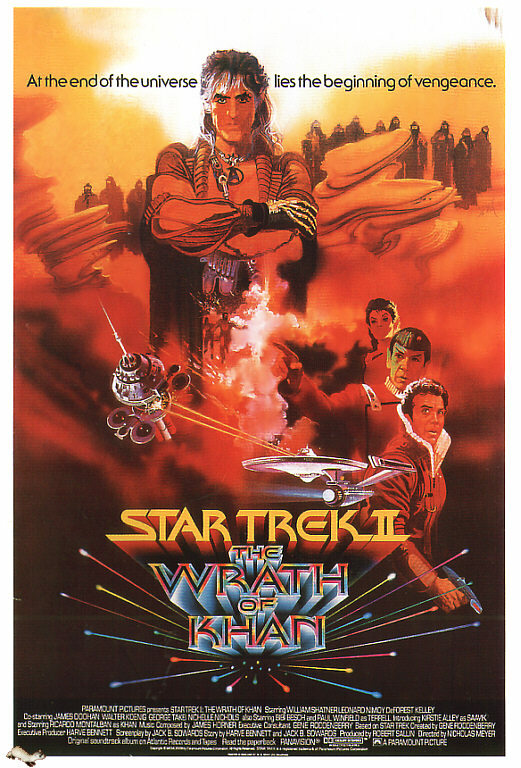 In preparation for my purchase of J.J. Abrams’s reboot of Star Trek on blu-ray, I’m revisiting the film that made all of the other sequels possible: Star Trek II: The Wrath of Khan. I try to watch this film once every couple of years, and it never disappoints. I came late to the Star Trek party overall, not being a fan of the original series and only being a casual watcher of TNG in the 90’s. My mom is the Trekker of the family. Back when mail order VHS tapes were the rage, my mom bought every Star Trek episode that Time Life offered. They’re still piled in her closet to this day. I watched Star Trek: Generations and Star Trek: First Contact when I was in junior high, and at the time it was only because I liked sci-fi action. I followed the TNG films through the years. I didn’t think Insurrection was that bad. The film just felt more like a long episode of the TV series. Nemesis was a good try, and there are some very good acting moments, but it just felt like another TNG series finale. It’s 2002, and I had pretty much given up on the Trek. When First Contact premiered on Special Edition DVD, I went to Best Buy to pick it up, and I also saw that Paramount had released a Special Edition of Star Trek II. All of my trekker friends insisted that it was the best film in the series and that I was crazy for never seeing it. I don’t like to be looked at as crazy after all, so I picked it up on a lark. I don’t usually buy DVDs sight unseen, but I had a good feeling. Thank Starfleet that my feeling was right, because right away I was hooked. I was 21, yet I felt like a 10 year-old again. Every room on the Starship Enterprise looked like a swinging 70’s bachelor pad strapped to a warp drive. The early special effects were bright and interesting. The acting was classic. Nimoy may have been the talent, but Shatner was the charm. James Horner’s score was lively and made the scenes even more fun. The action sequences were large and reckless, yet had the timeless poise of an old sea epic. If Shakespeare were alive, he might have been a script doctor on this film, especially for Khan’s dialogue. 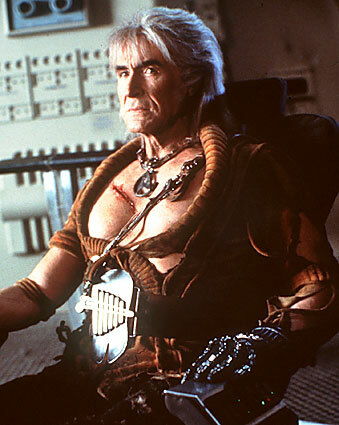 Those pecs aren't corinthian leather, but that outfit sure is. 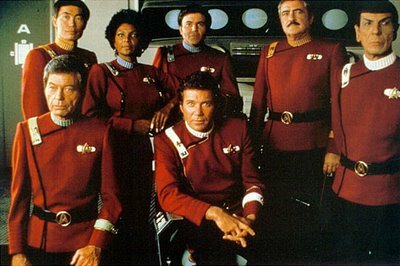 All in all, Star Trek II renewed and expanded my love for the Star Trek series. Every time I come across the original series on TV, I watch at least a few minutes if not the entire episode. TNG is a bit more involved, and I’ll only watch it if I catch it at the very beginning. In addition to the TNG films, I’ve now seen Star Treks II, IV, and VI. I’m planning on writing a review of the odd numbered Trek films very soon. I’m a little afraid, since I’ve heard less than positive things about them, but that’s what makes writing about them so fun. Space. We thought it was the final frontier. We had been on the voyages with the various Starfleet commands. We wanted to boldly go where no one had gone before. Then, forty years later, we realized that there was no more frontier. It had been paved over, and repaved over several times after that. The USS Enterprise had become an antique, and its exploits became quaint reruns on basic cable. It didn’t seem like there would ever be hope for Star Trek. In the end, it took a non-Trekker in the form of a certain J.J. Abrams to do what others couldn’t: He shook off the cobwebs, installed a new warp drive, and blasted off from scratch. Star Trek is back and better than ever! In Star Trek, the new James Tiberias Kirk is a man willing to face certain demise because he faces it every time he looks into a mirror. Kirk may be haunted by the death of his father, but he also recognizes that the apple did not fall too far from the tree. Chris Pine (Smokin Aces) brings a natural energy to the role. His Kirk is rakish and impulsive, defying authority at every chance but never backing down from a challenge. His inner strength fuels his naked will to do what is right, no matter what. Pine captures the unorthodoxy and charm of Shatner’s Kirk but leaves out Shatner’s eccentricities. Spock has always been complicated, but never this much. This spin on the series highlights the duality of the Spock character, and makes it part of his overall character arc. As a 21st century remix of Leonard Nimoy, Zachary Quinto (Heroes) displays all of the measured Vulcan logic expected of Spock, but shadows it with a slow burning intensity. In this Trek, Spock is a being caught between two worlds, and must decide for himself which path he will choose. He is not content with simply being accepted as a Vulcan, but cannot bring himself to indulge his human side either. Even in moments when Spock is justifying the logical decisions he makes, we can see him struggling with his own anger and frustration, and the moment when Kirk goads Spock into finally releasing his demons is definitely one of the best moments in the whole film. The rest of the crew is an entertaining bunch. As space heroine Uhura, Zoe Saldana (Pirates of The Caribbean) is given double duty, matching Kirk’s fearless nature while providing a beating heart for Spock. It’s a shame her part was so limited. Same goes for Karl Urban (Lord of The Rings) as Dr. Leonard “Bones” McCoy. His McCoy is less gruff and more neurotic than the classic TV doc, but it fits the film’s more naturalistic approach. Every line he speaks is gold or near-gold and steals about every scene he’s in, that is until Simon Pegg pops up as kooky engineer Montgomery Scott. Pegg (Shaun of The Dead, Hot Fuzz) has the least amount of screen time, but when he does show up, he leaves us smiling if not in full laugh mode. John Cho (Harold and Kumar 1 & 2) turns in an unexpectedly straight performance as Sulu, getting his day in the heroic sun during the furious “space jump” sequence. Anton Yelchin (Charlie Bartlett) is classic Chekhov, replicating Walter Keonig’s trademark Russian while dialing down its stereotypical elements. Bruce Greenwood has played captains and leaders before in films like The Core and Thirteen Days, but he looks like he’s having too much fun as Christopher Pike (Captain Kirk’s prototype). Look out for Mr. Leonard Nimoy as “Spock Prime”. I’d need another article to explain why there are two Spocks. It makes sense, believe me. It’s just something that needs to be seen. Last, but not least, Eric Bana (Troy, The Hulk) brings us the freshest Star Trek villain in years as a genocidal Romulan aptly named Nero. His vengeance toward the Federation runs deep, forcing his would-be pursuers to share his pain, which is more connected to a certain Enterprise crew member than we know. From the heart shaking opening assault on the USS Kelvin to the climactic battle on Nero’s Romulan Death Ship, Star Trek fits an epic space saga into a snug two hours. Using good old-fashioned storytelling and eye popping visuals, J.J. Abrams (Co-creator of TV’s Alias and Lost, Mission Impossible III) brings back the earnestness and sense of adventure of classic summer blockbusters. Star Trek uses eye-popping special effects and innovative set design to reinvent the Trek universe, but their reinvention also pays subtle tribute to the Treks of old. There are so many references to the old shows and films that, again, I would need another article to get them all down. Let’s just say that when characters would say their certain lines that we all remember, they incorporate them so well into the story that they felt like they had never been spoken before. Also, for being a reboot, the film doesn’t short change the fun of the original series just to work in some heavy handed dramatics, unlike Superman Returns. Skeptics could argue that the science in the film is very “huh?” worthy, but considering that it’s Star Trek, you just have to go with it. It’s a great adventure reminiscent of vintage Spielberg and Lucas, and I’ll definitely be there for the next one. To quote a future classic line: “I love this ship! It’s so exciting!” Beam me up, Mr. Scott!